HomeConspiracyMajor Anomalies Detected In Jaw-Dropping Superstorm Making Its Way Across America – Has This Beast Been Weaponized? Major Anomalies Detected In Jaw-Dropping Superstorm Making Its Way Across America – Has This Beast Been Weaponized? 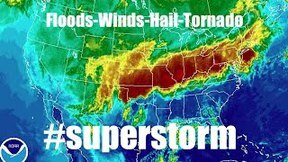 The story over at Strange Sounds that Steve Quayle linked to on his website on Saturday reported upon the massive and powerful superstorm system that stretched from New York to the Texas Panhandle over the last several days, spawning several deadly tornadoes and pummeling the central part of America with up to 6″ of rain and more in some places. 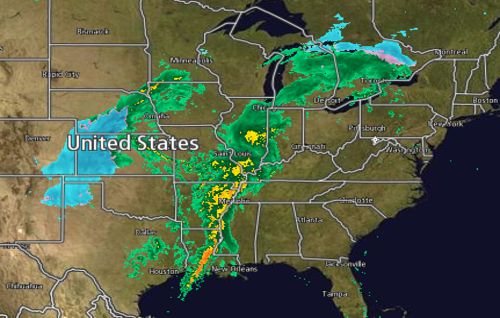 Leading to the deaths of at least 5 in Canton, Texas along with dozens of injuries, the Strange Sounds story reported “it looked like an anomalous ‘energy rush’ of some sort” while warning this storm system is forecast to continue to grow and could lead to downpours, floods, snow, tornado, hail, winds through much of the weekend. The first screenshot seen at the top of this page showed the deadly storm system on Saturday while the screenshot below, also taken from Intellicast on Sunday morning, still show a beastly system stretching from the Gulf of Mexico to the Great Lakes and the border with Canada, looking almost like a beast with a head, beak and a mouth, a body, legs and tail. On countless fronts the rate of change currently unfolding in our biosphere is beyond true comprehension. So few understand (or even want to understand) the severity and immediacy of the growing challenges that we must collectively face if we are to survive much longer on this planet. More and more data is surfacing about the dangers of atmospheric particulate pollution and radiation exposure. The vast majority of industrialized societies are so totally disconnected from the natural world that very few even notice the rapidly dying ecosystems around them. Material distractions have blinded the majority to the fact that without a functional habitat, without a living web of life on our planet, we will all die. Who will stand by and let this happen? Who will stand against the insanity in a valiant and critical effort to sound the alarm and alter our current course? Should weather modification be where the line is drawn between ‘real’ news and ‘fake’ news? As has been reported within the ‘alternative’ media for many years, weather modification can be proven in over a hundred years of weather modification patents and other documents and while the ‘mainstream media’ will continue to call weather modification a ‘conspiracy theory‘, anyone paying close attention to what’s being sprayed into the skies above our heads will argue differently. As we reported on ANP back on July 6th of 2016, even former CIA head William Brennan admitted to chemtrails and weather modification in a speech he gave to the Council of Foreign Relations. Was the CIA head just peddling ‘fake news’ to the CFR when he made the comments below on June 29th of 2016? 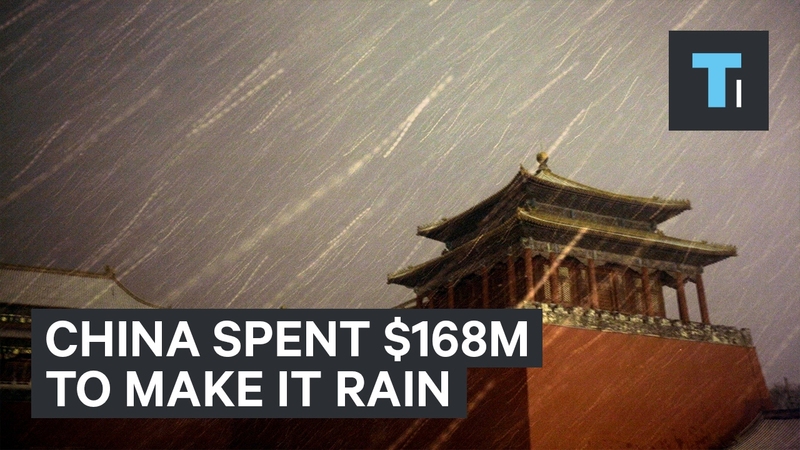 Back on January 25th we reported on ANP that China had was planning on making it rain over an area twice the size of France. Was China’s announcement that it could control the weather and plans to make it rain just ‘fake news’? As Wigington reported, most of the people living in industrialized nations are so completely out of touch with the natural world that very few notice the dying ecosystems happening in much of the natural world, especially within the large cities, the masses heads buried so in their smart phones they might as well be sand. And with tens of millions of Americans still getting their news from the ‘fakestream media’ and their refusal to tackle head on weather modification, chemtrails and our dying atmosphere, tens of millions will remain ignorant as those who think they know what’s best for our planet continue to attempt to play God and meanwhile destroy it. As Steve Quayle reported in his book “Weather Wars & Un-Natural Disasters” long ago, “Technology will make available, to the leaders of the major nations, techniques for conducting secret warfare, of which only a bare minimum of security forces need be appraised… Techniques of weather modification could be employed to produce prolonged periods of drought or storm.” And was the US Air Force’s document “Weather As A Force Multiplier: Owning The Weather In 2025” just ‘fake news’? If not, why does the msm refuse to report upon this? As long as the msm refuses to report upon weather modification and weather warfare, we’ll know they’re continuing to peddle ‘fake news’. In the first video below we hear directly from Wigington in his latest geoengineering update while for the doubters, the 2nd video below takes a look at China’s recent plans to make it rain. And while we’re not in the position to confirm that the monster storm now making its way across the country was created by ‘weather modification’, in the 3rd video below we hear a report from videographer MrMBB333 about the jaw-dropping superstorm that has been forming across the US and some very strange anomalies he’s noticed that have come along with it including an extremely strong energy signature. For those who are interested, here’s another website that deals with how cloud seeding and weather modification works. In the final video below, a citizen journalist goes into one of the many companies across America that perform ‘weather modification’ work for government’s and other huge businesses and gets bombshell proof from the mouth of one of their own employees about the kind of work they do. Why would the msm continue to call such work ‘conspiracy theory’ and claim that those who speak of weather modification and chemtrails should be wearing ‘tinfoil hats’? If we can’t even get the truth from the msm on this now proven subject, what can we believe from them?